Greece was able to secure the concessions it had wanted on its EU loan; so far, the details suggest that (a) Greece was able to extend the maturity from 3 to 7.5 years and (b) it was able to drop the interest by 100 basis points (1 percentage point). In the past, I have said that I considered such an extension to be a no brainer, noting that, “if no extension comes, Greece is almost sure to default and might as well give up on the program now” (see here). In this post, I want to look at what Greece has accomplished and why it matters. The first thing to understand is that the loans from the Europeans and from the IMF are quite distinct. The IMF loan is priced at ~3.5%, although the actual interest is market-driven plus a surcharge (see here). 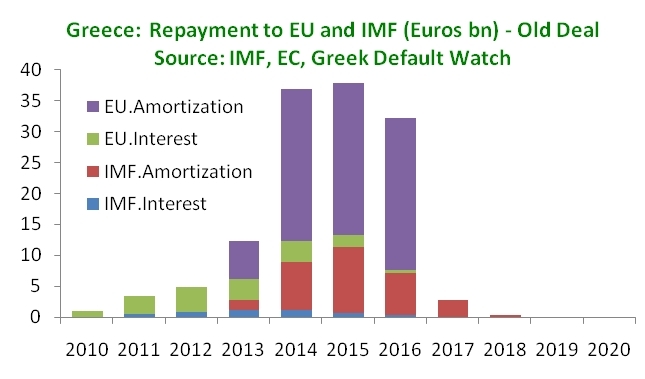 The IMF staff reviews show that Greece would repay its loan by 2018 and the assumed interest rates shown on the annual disbursements amount to ~3.6% percent. Since late 2010, Euribor has averaged a little over 1% - so the interest for Greece is that 1% plus 300 basis points (4%), plus a one-off service fee, plus an escalation after the third year of repayment. 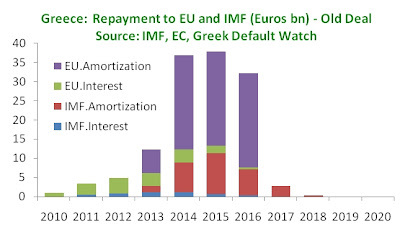 Given the payments from the troika are made until April 2013, and assuming that the repayment trigger is similar to the IMF loan (3.5 years after first disbursement), Greece would start paying back the EU in October 2013 and amortize the loan over three years (October 2016). With €80 billion to pay back, that’s quite a burden for a three-year period. Truth be told, the numbers are a bit murky and often contradictory. 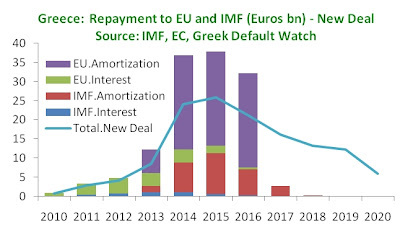 Yet I think the graph below – which includes some of my own calculations – gives a good enough picture of what Greece’s repayment schedule would look like (this is a bit different that the schedule I published in the past, in part due to more precision on the EU loans). Just to pay back the IMF and EU, Greece would need to devote 15% of GDP in 2014 and 2015 - clearly a very high number. The new deal does two things: it lowers the interest rate, although it is not clear whether the 100 basis point jump remains after year three (so is the new interest rate Euribor+200 and then Euribor+300?). Greece has also extended the repayment period from 3 to 7.5 years. The blue line shows the new total repayment schedule for both the EU and the IMF loans (the IMF loan having remained the same). 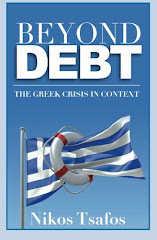 PM George Papandreou told the press that the new deal will save Greece €8 billion. Frankly, I have no idea how it will do this. Even on a nominal basis, the higher remaining principal and the lower interest almost offset each other – so the interest payments for the first three years are fairly similar. What is different of course is the principal – Greece has to pay just as much money, except it will pay it later and with interest. Do not get me wrong: this is a good deal for Greece and an essential one at that. 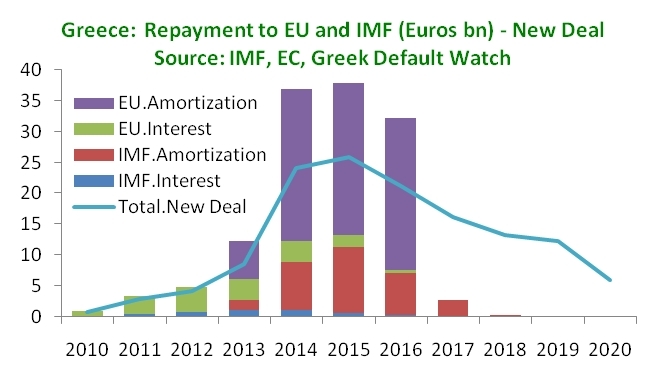 It is not a deal that will save Greece money, but it is an essential deal to alleviate pressure on the key years 2014 and 2015 when Greece will be expected to rely more and more on the market to refinance debt. Was Greece able to secure the concessions it had wanted on its EU loan?